Make Up For Dolls: Sleek iDivine Acid Palette features a surprising twist! Sleek iDivine Acid Palette features a surprising twist! Sleek iDivine Ac-iiiiiiiiiiiiid palette! Get a load of those colours! At this stage my love of The House of Sleek (Makeup!) should come as no surprise (look here and here and here and here and I guess here, oh, here too why not). 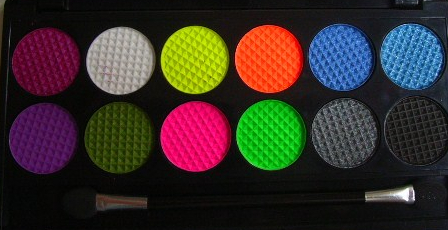 There's a bunch of Sleek stuff I also have that have never reviewed, among them pretty much all of the blushers, bronzers, highlighters, contours, some mascaras and lipsticks, a bunch of other eyeshadow palettes (Good Girl, Bad Girl to follow) and this one, the Sleek Acid palette. With flash, to show off the sparkles in the shimmer shades. As with all other Sleek eyeshadows these are mineral-based, highly pigmented but quite soft, they're relatively easy to blend but there's usually quite a bit of fall-out (see previous reviews on Sleek Mattes (Darks and Brights) for more thoughts on working with Sleek eyeshadows. The key thing about Sleek for me is that the palettes are cheap-as, and frequently feature unusual colours that you don't get elsewhere. All of these were easy to use except (as mentioned in the caption above) the purple (but then again, most purple eyeshadows are patchy at best) and the white (completely pointless on its own). The matte shades are a little bit chalky, but over a primer work really really well - for example I have used the pink and the orange on top of Make Up For Ever Aqua Creams, and the shimmer shades on top of MAC Paintpots in similar colours. The fun bit? The fluorescent colours do as you'd expect, and fluoresce under dark (UV) light! This was a fun discovery, when I saw the mad fluoro-shades, I wondered would they actually fluoresce, so I got myself a darklight (good old eBay!) and checked it out and voilà! What would you use them for? Well, you could use them as-is. Or add a mixing medium of one sort or another to turn them into eyeliner, or a body paint (Sleek eyeshadows work nicely with water-, gel- and alcohol- based mixing media I've used). Would I recommend this palette? Hell yeah! There are enough "ordinary" shades in this (and bearing in mind it's around the €9 mark) that you don't have to use the fluorescent ones if you don't like. 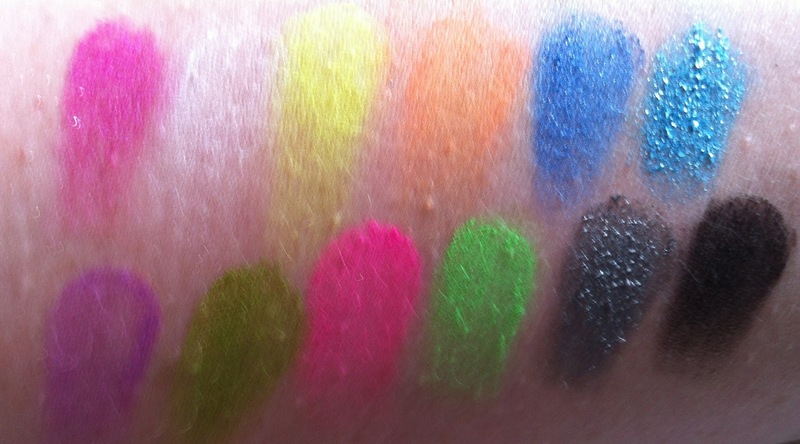 But I particularly love the pairing of Make Up For Ever Aqua Cream #23 (Acidics Green) with the fluoro-green here, or #9 (Coral) with the fluoro-orange or #7 (Fuscia) with the fluoro-pink, a winged out black liner, and lashings of mascara. Not a look for the fainthearted, but a lot of fun!